Perfection! 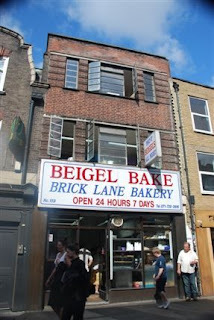 A salt beef bagel at The Beigel Bake. Rating 5 Stars. The best restaurant in its genre in London. The recent Jewish New Year got us here at the ethnic food blog thinking about one of our favorite things-- delicious, crisp-on-the-outside, chewy-on-the-inside bagels. London, of course, is not New York City-- there aren't little bagel places in every neighborhood offering up their own versions of everyone's favorite warm, bready treat. But for those who know where to find them, the beigels here can be fantastic-- and come packed with a little British twist. The best place we've been to by far is The Beigel Bake, a little 24-hour, hole in the wall on Brick Lane that also happens to be London's oldest beigel shop. Sandwiched in the middle of an area now known as the heart of London's Bangladeshi community, this tiny, white-walled shop, offers up a variety of bagels (and donuts too) slathered in butter or jam or stuffed and served as sandwiches, all at stunningly low prices. 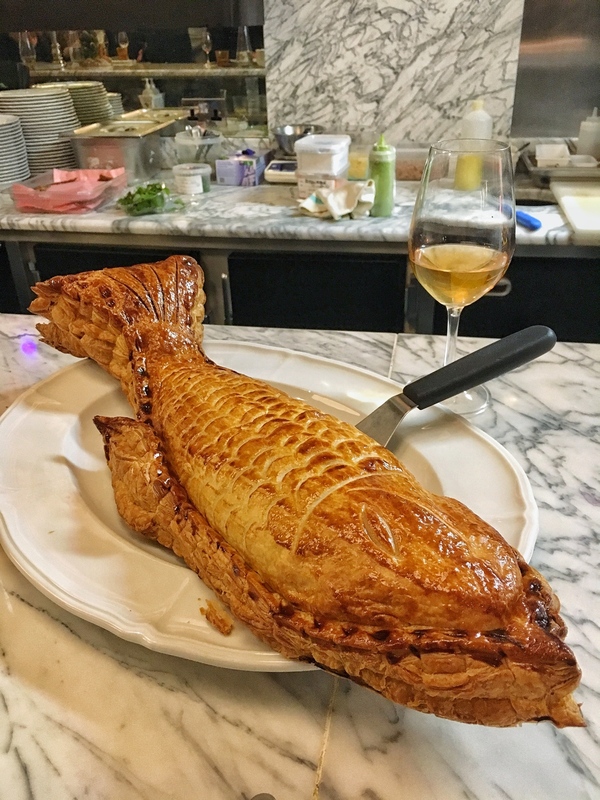 When we went at 1 am on a Friday, the gruff staff behind the counter and the various drunk hipsters in from Shoreditch made the place strangely endearing in a rough-around-the-edges way too. 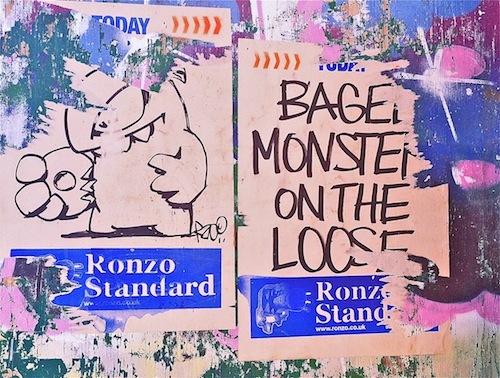 Art imitates bagels in Shoreditch. Less impressed with the "beigel" and lox. Less impressive to us when we went was another classic Jewish dish, the bagel sandwich with lox (£1.80). Here, the salmon sandwiches are pre-made, wrapped in paper and served cold, sort of like something you'd get a Pret-a-Manger. They were small too, and skimped on the salmon, making us immediately feel that we needed a second one-- which was feasible given the price. Donuts, cheesecakes and sausage rolls rounded out the menu, but here, the "beigel" is clearly the star. That's what everyone around us was eating, anyways. Note that this place is great for quick stops in, late-night noshing, or picking up a bagel before strolling through the neighborhood or over to the Columbia Flower Maket: There's only one, long counter for eating-- and it's standing only. 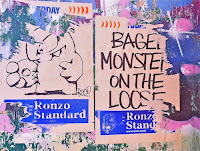 Plan on jockeying with some locals for space, warm bagels in hand. Word of warning to the observant: Although most things on the menu here are kosher, the meat on the salt-beef bagel, which originates in Ireland, is not! The picture alone pretty much sold me on the salt beef bagel--but your description convinced me even more!